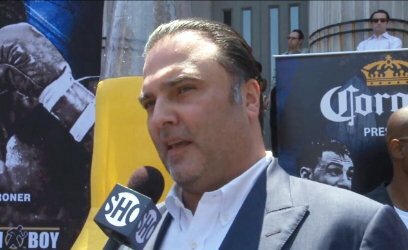 Richard Schaefer, the CEO of Golden Boy Promotions, has resigned from the company as of today. This was no surprise as Schaefer and Oscar De La Hoya had recently bumped heads over the issue of mending the fence with Top Rank. De La Hoya was in favor of patching things up with Bob Arum and Top Rank, whereas Schaefer was against it. Schaefer had been with Golden Boy Promotions for 12 years and was a huge part of the company’s success. De La Hoya had the name, but Schaefer did a lot of the hard work in putting cards together and signing high quality fighters. The departure of Schaefer leaves in question whether Golden Boy Promotions will continue to have Al Haymon-signed fighters on their fight cards. A great number of the big named fighters on Golden Boy’s shots were actually signed with Al Haymon. But with Schaefer gone, it’s unknown whether the Haymon fighters will still be on Golden Boy’s cards or whether they’ll be televised separately. Without the Haymon fighters, Golden Boy Promotions will have a far different look with far fewer names than in the past. It’s going to be interesting to see if Schaefer joins up with Haymon now to promote the huge amount of fighters that have recently signed with him. If so, they could be the new promotional giant in boxing. With Schaefer’s knowledge of the boxing business, he could join up with Mayweather Promotions, as he had a very good working relationship with Floyd Mayweather Jr, who he sees as a good friend. Schaefer could also form his own promotional company and slowly sign fighters the way that Al Haymon has been doing. Schaefer has a promotional license so he could start his own company. As for Golden Boy, De La Hoya is going to need to sign an interim CEO to run the company until he can find a replacement CEO, unless he himself wants to take over the difficult job.